Munich has some incredibly huge Gates, all well maintained. When you stroll through them you will feel how it was living in Munich's history. What now follows are four of the Munich Gates, still in good shape. This triumph gate is a monument to the Bavarian Army, rigged out of a Bavaria with a lion quadriga. In 1843, Gartner started to build this gate, while his pupil Metzger accomplished it in 1850. On its south side it has the inscription, "Dem Sieg geweiht, im Krieg zerstört, zum Frieden mahnend." (Ordained to the victory, destroid in War, reminding to the peace). Hmm... looks like the Brandenburg Gate's child, doesn't it? The most easterly of the gates is the Isartor, dating back to the 14th century. Careful restoration makes it possible to admire the dimensions and appearance of the original structure. The Isar Gate accommodates a museum honouring the Munich comedian Karl Valentin. The western town gate also dates back to the 14th century. 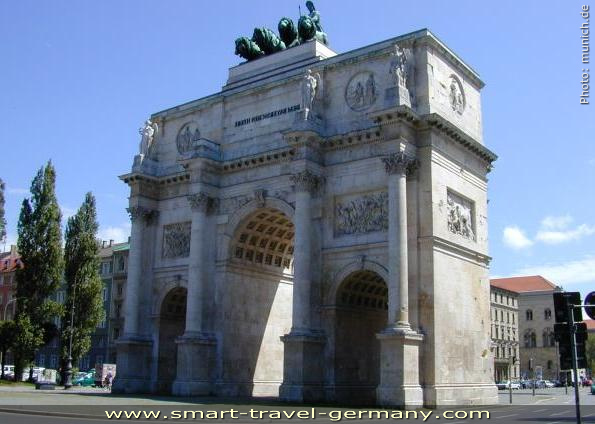 Since the end of the 18th century it is integrated into the square known as "Stachus" (officially called Karlsplatz). Today the Karlstor marks one end of Munich's primary pedestrian shopping zone. In the Middle Ages the southern gate controlled the North-South traffic. Its main tower was destroyed in 1808, but the hexagonal towers left and right of the gate remain until today.